In March 2018, the American Academy of Periodontology (AAP) and the European Federation of Periodontology (EFP) jointly published a supplement to the Journal of Periodontology (representing the AAP) and the Journal of Clinical Periodontology (representing the EFP) detailing the development of a revised classification system for periodontal and peri-implant diseases and conditions.1Caton JG, Armitage G, Berglundh T, Chapple ILC, Jepsen S, Kornman KS, Mealey BL, Papapanou PN, Sanz M, Tonetti MS. A new classification scheme for periodontal and peri-implant diseases and conditions – Introduction and key changes from the 1999 classification. J Periodontol 2018;89(Suppl 1):S1-8. The history of classification of the periodontal diseases dates to 1989,2Consensus report on diagnosis and diagnostic aids. In: World Workshop in Clinical Periodontics. Chicago: American Academy of Periodontology; 1989:I23–I31. and new data from basic, translational and clinical research studies required a re-assessment of the classification scheme. This new system replaces the previous system that was introduced in 1999.3Papapanou PN, Sanz M, et al. Periodontitis: Consensus report1999 document of workgroup 2 of the 2017 World Workshop on the Classification of Periodontal and Peri‐Implant Diseases and Conditions. J Clin Periodontol 2018;45(Suppl 20):S162–70.,4Lang N, Soskolne WA, Greenstein G, et al. Ann Periodontol 1999;4:78. ,5Lang N, Bartold PM, Cullinan M, et al. Consensus report: aggressive periodontitis. Ann Periodontol 1999;4:53. The new classification system now includes 3 categories under “periodontal diseases and conditions,” with a total of 11 subcategories, and 4 subcategories under “peri-implant diseases and conditions.” (Figures 1, 2) Each of the subcategories under “periodontal diseases and conditions” is further subdivided into specific disorders. The new classification system has some important changes relative to the 1999 system that should be highlighted. Gingivitis is considered reversible, but once a patient has periodontitis they have that diagnosis for life, even if the periodontitis is successfully treated. Life-long maintenance of the successfully treated patient is essential. Systemic diseases that have a periodontal manifestation (e.g., Papillon-Lefèvre Syndrome) are classified according to the underlying systemic disease, using the International Statistical Classification of Diseases and Related Health Problems (ICD). Mucogingival conditions are classified based on interproximal attachment loss and consider root exposure relative to the cementoenamel junction. deficiencies (which can occur following normal implant healing in a deficient area that was affected by tissue loss due to prior severe loss of periodontal support or endodontic infection). In addition to reports that were prepared prior to the World Workshop, there were 4 working groups at the meeting and each issued a consensus report at the conclusion of the meeting. Some highlights of the discussion at the meeting are provided below. Workgroup 1 discussed periodontal health and gingival diseases and conditions on an intact and a reduced periodontium.6Chapple ILC, Mealey BL, Van Dyke TE, Bartold PM, Dommisch H, Eickholz P, et al. Periodontal health and gingival diseases and conditions on an intact and a reduced periodontium: Consensus report of workgroup 1 of the 2017 World Workshop on the Classification of Periodontal and Peri-Implant Diseases and Conditions. J Periodontol 2018;89(Suppl 1):S74-84. Key points raised during the discussion included: periodontal health was defined as the absence of clinically-observable inflammation. This means that persons with a fully intact periodontium (no attachment or bone loss), as well as a person with a reduced but stable periodontium (as a result of treatment for periodontitis or crown-lengthening procedures) can be in this category. Gingival diseases are divided into those that are biofilm induced and those that are not induced by biofilm. Examples of the latter include hereditary gingival fibromatosis and manifestations of human papillomavirus such as verruca vulgaris. Workgroup 2 discussed the classification of periodontitis, specifically the subclassification based on staging and grading.7Papapanou PN, Sanz M, Buduneli N, Dietrich T, Feres M, Fine DH, et al. Periodontitis: Consensus report of workgroup 2 of the 2017 World Workshop on the Classification of Periodontal and Peri-Implant Diseases and Conditions. J Periodontol 2018;89(Suppl 1):S173-82. Staging is divided into 4 categories (I, II, III, and IV) and depends on severity and complexity, as well as extent and distribution. (Table 2) Grading is based on primary criteria and other modifiers. (Table 3) Similar details are provided for necrotizing periodontal diseases, endodontic-periodontal lesions and periodontal abscesses. Here the reader is referred to the Proceedings of the Workshop. Workgroup 3 discussed periodontal manifestations of systemic diseases, as well as developmental and acquired conditions.8Jepsen S, Caton JG, Albandar JM, Bissada NF, Bouchard P, Cortellini P, et al. Periodontal manifestations of systemic diseases and developmental and acquired conditions: Consensus report of workgroup 3 of the 2017 World Workshop on the Classification of Periodontal and Peri-Implant Diseases and Conditions. J Periodontol 2018;89(Suppl 1):S237-48. The differences between rare systemic conditions (e.g., Papillon–Lefèvre syndrome) which have distinct periodontal manifestations and modification of periodontal disease by disorders such diabetes, or modifiers such as cigarette smoking were highlighted. Another key point is the observation that excessive occlusal forces do not result in attachment loss but can result in tooth mobility. Workgroup 4 discussed peri-implant diseases and disorders.9Berglundh T, Armitage G, Araujo MG, Avila-Ortiz G, Blanco J, Camargo PM, et al. Peri-implant diseases and conditions: Consensus report of workgroup 4 of the 2017 World Workshop on the Classification of Periodontal and Peri-Implant Diseases and Conditions. J Periodontol 2018;89(Suppl 1):S313-8. It was noted that “peri-implant health” can be present even when the implant demonstrates reduced bone support. Dental plaque/biofilm was identified as the major etiologic factor in peri-implant mucositis. Peri-implantitis demonstrates inflammation of the mucosal tissue and loss of bone support. Nevertheless, the discussion highlighted the fact that there are many types of dental implants, with different designs (including surface characteristics) as well as procedures for placement and ultimately loading. Consequently, the workgroup suggested that the treating clinician record clinical and radiographic parameters once the implant is in function, and refer back to these data to determine if any pathologic change has occurred. This new classification system relies upon the extensive literature on disorders of the periodontium, and on dental implants, to justify the new scheme. A goal of this new classification system is to “provide a globally consistent approach to diagnosis and management and ultimately improve outcomes" for patients.10Medical Press: New classification of periodontal and periimplant diseases and conditions. 2018, 21 June. Available at: https://medicalxpress.com/news/2018-06-classification-periodontal-periimplant-diseases-conditions.html. 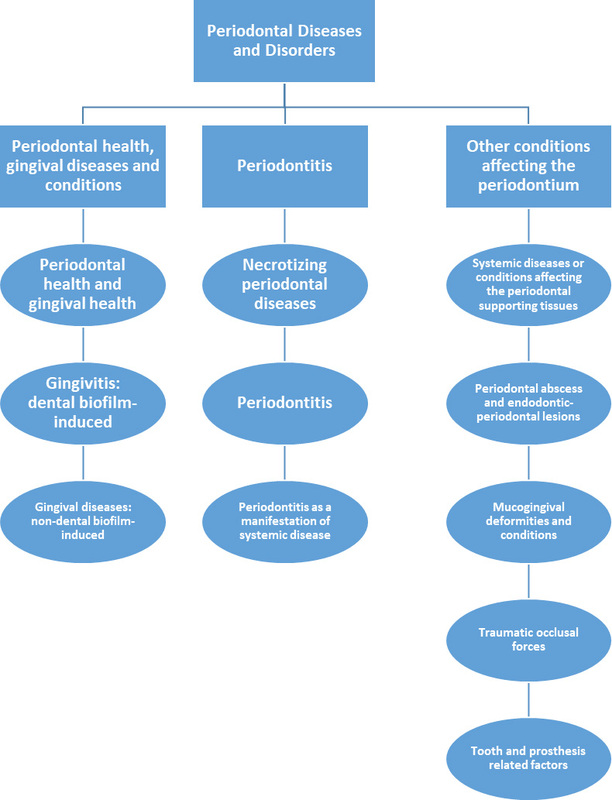 It will require time for clinicians to digest and begin to apply this new classification scheme, especially considering the added complexity in the classification of certain disorders (i.e., “periodontitis”). Interested readers are urged to refer to the proceedings of the World Workshop on the Classification of Periodontal and Peri-Implant Diseases and Disorders that is open access on the Journal of Periodontology and Journal of Clinical Periodontology websites (June 2018). Severity: Interdental attachment loss at the site with greatest loss; radiographic bone loss and tooth loss. Complexity of management: Probing depths, pattern of bone loss, furcation lesions, number of remaining teeth, tooth mobility, ridge defects, masticatory dysfunction. 1.Caton JG, Armitage G, Berglundh T, Chapple ILC, Jepsen S, Kornman KS, Mealey BL, Papapanou PN, Sanz M, Tonetti MS. A new classification scheme for periodontal and peri-implant diseases and conditions – Introduction and key changes from the 1999 classification. J Periodontol 2018;89(Suppl 1):S1-8. 2.Consensus report on diagnosis and diagnostic aids. In: World Workshop in Clinical Periodontics. Chicago: American Academy of Periodontology; 1989:I23–I31. 3.Papapanou PN, Sanz M, et al. Periodontitis: Consensus report1999 document of workgroup 2 of the 2017 World Workshop on the Classification of Periodontal and Peri‐Implant Diseases and Conditions. J Clin Periodontol 2018;45(Suppl 20):S162–70. 4.Lang N, Soskolne WA, Greenstein G, et al. Ann Periodontol 1999;4:78. 5.Lang N, Bartold PM, Cullinan M, et al. Consensus report: aggressive periodontitis. Ann Periodontol 1999;4:53. 6.Chapple ILC, Mealey BL, Van Dyke TE, Bartold PM, Dommisch H, Eickholz P, et al. Periodontal health and gingival diseases and conditions on an intact and a reduced periodontium: Consensus report of workgroup 1 of the 2017 World Workshop on the Classification of Periodontal and Peri-Implant Diseases and Conditions. J Periodontol 2018;89(Suppl 1):S74-84. 7.Papapanou PN, Sanz M, Buduneli N, Dietrich T, Feres M, Fine DH, et al. Periodontitis: Consensus report of workgroup 2 of the 2017 World Workshop on the Classification of Periodontal and Peri-Implant Diseases and Conditions. J Periodontol 2018;89(Suppl 1):S173-82. 8.Jepsen S, Caton JG, Albandar JM, Bissada NF, Bouchard P, Cortellini P, et al. Periodontal manifestations of systemic diseases and developmental and acquired conditions: Consensus report of workgroup 3 of the 2017 World Workshop on the Classification of Periodontal and Peri-Implant Diseases and Conditions. J Periodontol 2018;89(Suppl 1):S237-48. 9.Berglundh T, Armitage G, Araujo MG, Avila-Ortiz G, Blanco J, Camargo PM, et al. Peri-implant diseases and conditions: Consensus report of workgroup 4 of the 2017 World Workshop on the Classification of Periodontal and Peri-Implant Diseases and Conditions. J Periodontol 2018;89(Suppl 1):S313-8. 10.Medical Press: New classification of periodontal and periimplant diseases and conditions. 2018, 21 June. Available at: https://medicalxpress.com/news/2018-06-classification-periodontal-periimplant-diseases-conditions.html.